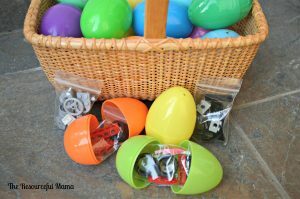 Are you looking for non-candy items to fill Easter eggs? Our kids love, love, love legos. We started using legos last year to fill their eggs and they were a huge hit. If you are using more than one lego set make sure you note somewhere which set the pieces belong to. We bought one set for each of the boys and put their initial on the egg with their pieces. If your kids are anything like ours, I suggest using the smaller bags. After finding all the eggs, our kids sit down and open all their eggs to see their loot. Small lego pieces are easy to lose. The bags fit nicely into the medium sized plastic Easter eggs. Leave any larger pieces that do not fit out with the directions. After the hunt we give any extra pieces, the directions, and a short note from the Easter bunny to the kids. Legos are a great Easter basket filler! They are also popular stocking stuffers in my house. Thanks so much for linking up at This Is How We Roll Thursday. We look forward to seeing more of your ideas! What a great idea. We thought about just buying LEGO but this is genius. I have pinned this on my LEGO board. This is such an awesome idea! Sometimes it’s challenging to find small toys that can fit into Easter eggs that aren’t junk, definitely pinning this for when my gal is old enough to enjoy Legos- thanks for sharing! I stopped by from Mom-to-Mom. What a phenomenal idea, it would definitely be a fun activity for Easter. Thanks for linking up to the Bloggers Brags Pinterest Party. I have pinned your post to the Bloggers Brags Pinterest Board. What a great non chocolate idea! These are so clever! My daughter has an affinity for legos, and this is a perfect alternative for candy in her Easter egg. Thanks for sharing such a brilliant idea on Totally Terrific Tuesday! This is a wonderful idea! I think I’ll do some of these for my grandson. Thanks for sharing on the Spring Craft Blog Hop. Great idea! I have been looking for noncandy Easter egg fillers. I make enough desserts as is so we don’t need a ton of candy haha! Yes!!! My Lego lover will love this!!!! What a great idea! I have some LEGO lovers in my house and this would be a great idea for them. I am pinning this one for sure. Thanks for sharing at Wonderful Wednesday! Thanks Jaimi! Hope your Lego lovers enjoy them! Thanks for featuring me as a favorite at Mom2Mom Monday linkup Tauna!!! What a great idea. Anything that is not sugar is a great filler. Stopping by from Wine’d down Wednesday.